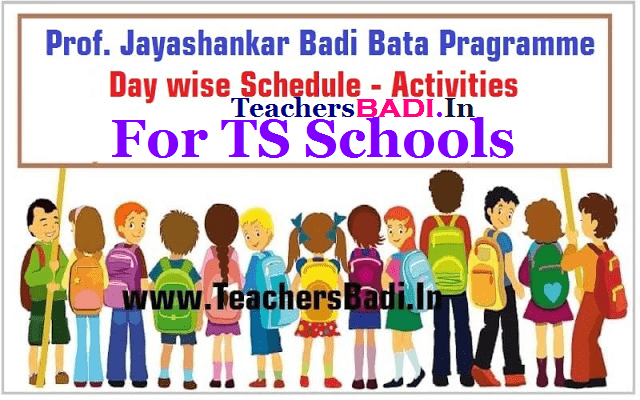 Prof Jayashankar Badibaata Programmes-Special Enrollment drive: TS School #BadiBata programme #Schedule-Day wise #Activities start from April 3rd, 2017:: TSSA Badi Bata Programme Schedule/Special Enrollment Drive Day wise Programme for TS Schools 2017: A Special Enrollment Drive Badi Bata Programme starts form April 3rd to 13, 2017 in all TS Schools. TSSA has announced the Badi Bata Programme as one of its Special Enrollment Drive/Campaign Programme to complete the Admissions of 2017 academic year in all Govt/Zilla Parishad Schools from 3rd to 13rd April, 2017 in connection with special drive for Community mobilization for enrollment of all school age children. The Schedule of Badi Bata has been prepared and released by TSSA on 016/03/2017. TSSA announced the Badi Bata Schedule for TS Schools and this 2nd spell Badi Bata programme Day wise activities start from June l 3rd to 17, 2017. The State Project Director, Telangana Sarva Shiksha Abhiyan, Hyderabad has issued the Circular and guidelines to conduct of “Badibata (Special Enrollment Drive) Programme 2017”. The District Collectors had issued Directions for conduction of Badibata programme 2016-17 in their Districts from April 3rd to 13, 2017 at District level. Therefore, the MEOs are informed to instruct all the Headmasters of your mandal to conduct Badibata (Special Enrollment Drive) programme as mentioned in the day wise schedule already sent to the MRCs. ➛Transition of lower class to higher class report and photos per day at DPO, SSA between 3.00 PM to 4.00 PM without fail. పాఠశాలలు పునఃప్రారంభమైన మరుసటి రోజు (ఈ నెల 13) నుంచి 17 వరకు ప్రభుత్వం విద్యాశాఖ ద్వారా బడిబాట నిర్వహించనున్నారు. - 13న ఇంటింటి ప్రచారం నిర్వహించి ప్రతీ పిల్లవాడిని బడిలో చేర్పించడం, 30 మంది కన్న తక్కువ విద్యార్థులున్న పాఠశాలల్లో నమోదు శాతాన్ని పెంచేందుకు పాఠశాల యాజమాన్య కమిటీ, ప్రజాప్రతినిధులతో ప్రత్యేక సమావేశం నిర్వహించనున్నారు. ఆంగ్ల మాద్యమాన్ని ప్రారంభించడం కోసం పాఠశాలల్లో సౌకర్యాలు, సంసిద్ధతలపై చర్చించాల్సి ఉంటుంది. - 14న రెండవ రోజు పిల్లల ఆరోగ్య పరీక్షల్లో భాగంగా జిల్లాలోని అన్ని ప్రభుత్వ పాఠశాలల్లోని విద్యార్థులకు ప్రాథమిక ఆర్యోగ కేంద్రం ఆధ్వర్యంలో వైద్య పరీక్షలు చేపిస్తారు. విద్యార్థుల ఆధార్ సేకరణ, ఇంటింటికెళ్లి ప్రచార కరపత్రాలను పంచడం, బడి బయట పిల్లల తల్లిదండ్రులను కలిసి పిల్లలను ప్రభుత్వ బడుల్లో చేర్పించుటకు ఒప్పించనున్నారు. 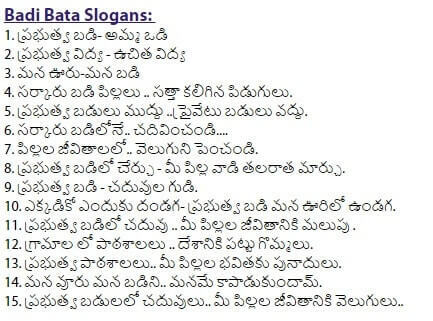 - 15న బాలికల రోజులో భాగంగా కస్తూర్బా బాలికల విద్యాలయాల ప్రత్యేక అధికారులు ఆ విద్యాలయంలో చేరే విద్యార్థులు, వారి తల్లిదండ్రులకు మౌలిక వసతులను చూపించడం, ఇంటింటికీ వెళ్లి ఆడపిల్లల ప్రత్యేకతలను వివరించాల్సి ఉంటుంది. -16 తేదీన స్వచ్ఛ పాఠశాల-హరితహారంలో భాగంగా పాఠశాలల్లో తాగునీటి సౌకర్యం, నల్లబల్లలకు రంగులు వేయడం, వృథా సామగ్రిని తొలగించి ఫర్నిచర్‌ను శుభ్రం చేయడం. పాఠశాలల్లో కొన్ని ఏళ్లుగా వృథాగా ఉంటున్న సామగ్రిని తొలగించడానికి పాఠశాల యాజమాన్య కమిటీ, పాఠశాల సిబ్బందితో ప్రత్యేక సమావేశం నిర్వహించి తీర్మానించాల్సి ఉంటుంది. - 17న బాలకార్మికుల విముక్తిలో కార్యక్రమంలో భాగంగా పోలీసు, రెవెన్యూ, ఐసీడీఎస్, లేబర్ డిపార్ట్‌మెంట్, ఎన్‌జీవోల సహకారంతో సర్వే నిర్వహించి బాలకార్మికులను విముక్తి కలిగించి కేజీబీవీల్లో చేర్పించడం. ఉపాధ్యాయుల, కమిటీ సమావేశాలు నిర్వహించి పాఠశాలల అభివృద్ధి ప్రణాళికలు, పాఠశాలల ఫలితాలు, బడి బయట పిల్లల నమోదుపై చర్చించాల్సి ఉంటుంది. 19. Responsible persons for implementation of Badibata programme are DEOs/ MEOs/Sectoral Officers. As such all the Mandal Educational Officers and Special Officers of KGBVs are requested adhere the instructions and prepare the action plan on implementation of Badibata programme from 13th to 17th June, 2017. Discussion on relocation of small primary schools, merging of upper primary schools nearby high schools, exclusive English Medium high schools by way of merging parallel English Medium sections with less than 80 enrollment and possible decision and agreement. · Discussion on the demand for English Medium from the parents and community and their preparedness to support to the school with enrollment and facilities. Based on these teachers to take decision on their preparedness to teach EM classes – a shared decision on starting of English Medium starting with class I. Meeting with SMC and discussion on OSC name wise based on Village Education Register (VER), plan for enrolment drives, House to House Campaign, etc. Meeting with parents of Dropout children, Never enrolled children as per the list and enroll them in schools, Special Training Centers, BhavitaCenters, KGBVs. Preparing the list of children to be enrolled in Special Training Centers, BhavitaCenters, KGBVs and forward the list to the MEO and a copy to the concerned. Conduct Enrolment Drive by the HM, SMC, Teachers, Youth etc. from 08.00 AM to 10.00 AM. Visiting AnganwadiCenters, BhavithaCenters, Special Training Centers in the catchment area and ensure their enrolment into the schools. Visiting the Brickline areas, construction sites and other establishments in their catchment area, where migrated families are working – Plan for the education of their children and enroll them in the schools / STCs. Conduct Enrolment Drive by the HM, SMC, Teachers, Youth etc. from 08.00 AM to 10.00 AM. · Meeting with parents and discuss on children performance on 3R’s based on baseline test. Discussion on the percentage of attendance of children pertaining to the academic year 2016-17 and request for regular attendance. Staff meeting – discussion on the implementation of remedial teaching to achieve the targets of 3R’s about 90% of children and setting targets with dates. Discussion with parents and SMC on support for School Infrastructure and for meeting the immediate needs, i.e., Toilets, Drinking Water, Haritha Haram ,etc. Meeting with SMC on Discussion on School Development Plan for improving the results, on lesson plans, positioning of VVs, OSC still not enrolled, attendance of the children, etc. Haritha Haram – Planting the trees and campus cleaning assigning the responsibility to the children for watering and protection of trees planted. 9. 11/04/2017 F.N. · Preparing the list of child labour working with employers. · Preparation of School wise infrastructure gaps i.e., Classrooms, Toilets, Drinking water etc. A.N. · Meeting the employers by the HM and SMC to relieve the children from work and join them in school, Special Training Center, KGBVs. Swachh Patashala – Attending the clean and green work of schools, i.e., painting black board, toilet cleaning, drinking water, dusting the furniture, removing the waste, etc. Every classroom must be clean and remove unnecessary dumping material in the corners. Preparing the final list of children not yet enrolled, item wise, i.e., Never Enrolled, Dropout, Who are eligible for KGBVs, Bhavita Centers, Special Training Centers, etc. pertaining to their catchment area and furnish the lists to the concerned MEO, Principal KGBV, Coordinators of Bhavitha Centers, STCs. Meeting with SMC to discuss on the progress of Badi Bata and action to be taken to enroll all the remaining children into schools, improving school facilities like toilets, drinking water, etc. Take the opinions of the students on Mid-day meal and toilets, drinking water, etc. and develop a plan of ac tion to attend the children grievances and opinions. · Conduct of cultural prograrmme with children (BalaSabha).